art-candy - Andrea's personal blog: I love Kung Fu!!!!!! 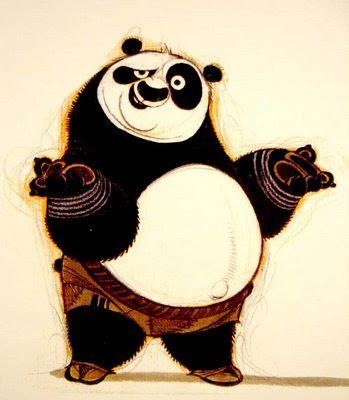 Variety.com has an interview here with Kung Fu Panda Character Designer Nicolas Marlet. Kung Fu Panda is a fantastic movie! Just saw it last night and I left the theater very inspired. The whole movie is beautiful but a lot of people are talking about the end and beginning credit sequences... You can watch the end credits, (animated classically!) here, animated by Shine Studios. James Baxter Animation did the opening credits which I really liked as well, unfortunately I couldn't find it posted online anywhere. You can check out the Enchanted Demo that James Baxter Animation put together however on the studio's site, among other tidbits.